I love the fit of this dress from Dahlia, and how the dark floral print and puffed shoulder detailing add to the quirky and witchy allure of this look! I tend to prefer bold floral prints, but something about this more subdued print, is very Halloween-y to me (of course, in a good way, because I love everything Halloween related!) which is why I like it so much. If you look even closer, there are white bows hidden in the print too! When it turns to fall, it'll be really easy to throw this dress on with a military jacket, some tights, and combat boots! I also have on this awesome lock and key belt! I've been hunting for the perfect skinny black belt but I've been very picky about the shape of the buckle and the color of the gold metal. So I was really happy when I saw this belt on Romwe because not only is the lock and key detail really "charming" (LOL) but the buckle looks like a little crescent moon! pretty belt! I love the outfit! You look adorable! stunning! love the dress and the hat! 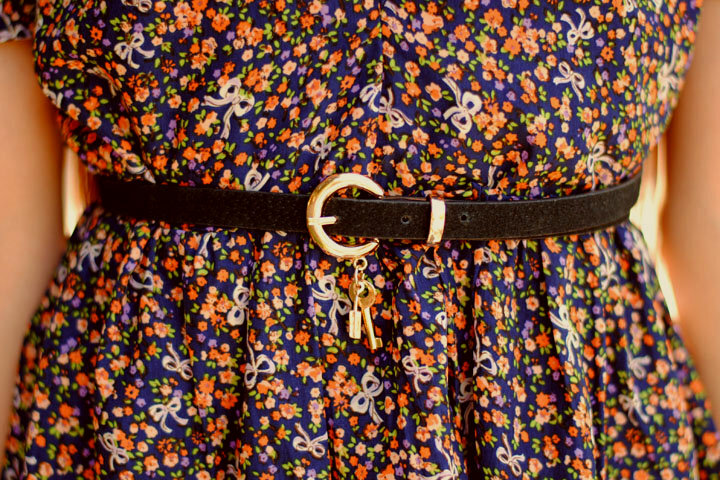 I really like this dress but the belt is extra adorable! You look amazing. Dark floral is so good. It can transition into the fall which is great! Pretty. your hair is so long ang gorgeous! nice outfit too!! Very cute! Where did you get your shoes?? I'm trying to look for a good staple booties like yours. Ah, I can't wait to see the Avengers laptop case.. so awesome! Also, I love the detailing on that belt. SO cute. This dress is truly lovely, in an understated way - the darkness is contrasted so well with the small pops of color from the flowers. Lovely outfit. Specially like your hat! stunning outfit! what a pretty dress! Absolutely love this dress, we just stumbled across your blog and are so happy we did! You have great style and take gorgeous photos, we are new followers.